Rental equipment for improving your lawn. Every year around this time, there’s at least one yard in the neighborhood everyone wishes were their own. It has the perfectly manicured lawn, the rounded hedges and the flowers that just won’t quit blooming. As you look at your own lawn, with the weeds and brown spots, you wonder where you went wrong. After all, you were out there mowing as much as your neighbors last year. Well, time to let you in on a little secret. Not only did those neighbors you envy so much spend time mowing their lawn, they also dethatched their lawn, aerated it, used a rototiller to turn up the dead patches and reseeded, but they also carefully re-edged along the sidewalks. Sound like an expensive proposition? It would have been had they hired a lawn service, or bought all the tools they needed, but they did the entire project themselves with rented tools. According to the American Rental Association (ARA), more and more people are turning to rented equipment and tools for their home improvement projects. Not only does renting offer significant cost savings, it is convenient as well. When you rent tools, you don’t have to worry about equipment maintenance or storage. You will also be able to take advantage of expert advice from a rental professional. These trained professionals will be able to guide you in the right direction and give you tips on how to operate the equipment in the safest and most effective way. They can also help you select the correct tools for your project. For example, if you visit your local rental business and say your lawn is looking sparse and brown, they’ll tell you that thatch — the layer of interwoven grass, leaves and stems that blocks water and nutrients from reaching the roots — is the likely culprit. To pull out the old thatch, you’ll be urged to rent a dethatcher, also called a power rake, which will remove the tangle of grass clippings, leaves and stems that have collected in your grass. The next step will be to rent an aerator, which is a gas-powered machine that actually pokes holes in the earth and removes cores of dirt as it goes. The holes allow nutrients, air and moisture to penetrate your lawn’s root system. Once that’s done, you’ll need to get out there and tackle the weeds. If you have any patches that are all weeds and no grass, you can use a rototiller to turn up the ground and then reseed. You’ll also want to rent an edger once or twice during the season to give your lawn that well cared for look. With a little effort and some cost-effective rental tools, your lawn may just become the pride of the neighborhood. At Rentalex, our professional rental representatives will make it easy for you to learn how to use the right tools for your project. 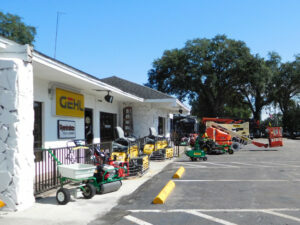 For more information on Rentalex, visit us online at www.Rentalex.com, or call us at (813)971-9990.